The name may still be new to many, but Josh Garrels has been generating a good deal of online buzz over the past few months. The Portland, OR singer/songwriter has spent years pursuing his craft with a truly DIY work ethic, shunning labels and celebrity culture to craft simple, honest music. His sixth project, Love & War & the Sea In Between, released in June 2011, and though it is the indie folk artist's grandest record to date, he chose from the beginning to make this project completely free for the first year via his website and Noisetrade.com. 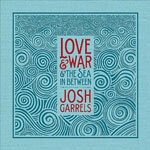 At the friendly price of nothing, music fans have no excuse to miss out on this project; in fact, folk lovers should probably stop reading this, go to JoshGarrels.com, and download it without hesitation. But to those still wondering if it's worth the hard drive space, know that Love & War is an expansive and lyrically rich collection of songs that make a spectacular introduction to Garrels' catalog, and is well worth the time to download and discover. Love & War is not the sort of "songwriter guy with a guitar" music usually associated with a "folk" label. Instead, it's a sprawling musical odyssey painted in broad strokes of earthy acoustic instruments, gritty hip-hop beats, and stirring orchestration. The opening track, "White Owl," does have the sound one would expect: acoustic strumming, weary vocals, and poetic nature imagery, while "Farther Along" works with the sort of gospel/country vibe that begs the listener to sing along. These earliest tracks give the impression of a mellowed-out indie folk record (albeit a well-produced and composed one), but then something magical happens around track four. "A Far-Off Hope" is a haunting, mysterious track that captures a mix of hope and longing without a word before fading neatly into the first surprise of the record, "The Resistance." As Garrels raps his way through a darker tinged hip-hop/folk fusion (think a rougher Bullet-era Mat Kearney), it somehow doesn't feel a bit out of place. Love & War clocks in at just over an hour, but 18 tracks give the project its epic scope. Several instrumentals punctuate the album to keep his eclectic music cohesive and grounded. Yet, as pretty as it sounds, the most notable element of Love & War is the lyrics. Garrels writes the kind of songs that read like poetry and unearth the sacred in the everyday, sometimes as intimate as songs about love and marriage, but most often digging deep into theology and mystery to capture the beauty of this world and hope for the next. True to the hip-hop sound it works with, "The Resistance" sets up some of his most down-to-earth storytelling with the first lines, "I was born into a system constructed for failure / It's a sinking ship manned by drunken sailors," before delivering a proclamation that, "The outcome will defy explanation / The liberation will not be televised / When it arrives like lightning in the skies." The mystery and the assurance of God making all things right is a recurring theme, whether expressed in the heartbreaking seafaring metaphors of "Ulysses" ("I'm holding on to the hope that one day this could be made right / I've been shipwrecked, and left for dead, and I have seen the darkest sights... / But oh my heart still burns, tells me to return, and search the fading light"), the Revelation-inspired Biblical language in "Revelator," ("He's like a lion like a lamb / As though slain he holds the plan / To make war and peace with man / And reign on earth"), or the hope and rejoicing found in "Beyond the Blue ("Yellow and gold as the new day dawns / Like a virgin unveiled who waited so long... / If theres any hope may it be a sign / That everything was made to shine / Despite what you can see"). Many other artists and music fans have fallen in love with Josh Garrels, and for good reason. His music sounds fresh, yet timeless, the kind of songs to absorb and let yourself feel rather than simply let run as background noise. The length and quirky style could be off-putting to some, but with no cost to risk and great music to gain, there is no reason to pass on this gem of an indie release.